Seasoned to perfection with our secret Cajun spices, these super, extra-large Virginia peanuts are flavorful and addictive. They are a tasty snack to make your taste buds sparkle and keep you coming back for more. 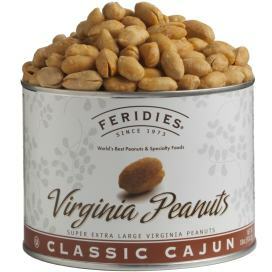 Select either our 18oz or 40oz can of Salted Virginia Peanuts and send it Monthly, Bimonthly or Quarterly (saving 10% over single can orders). A letter will be sent with the initial order describing the club plan and how often peanuts will be sent. Do not add shipping charges for addresses within the U.S. Expedited shipping services are not available for club plans.